If you take a peek right now at the 'toy corner' of our family room you will find 2 wicker baskets holding the toys - which are open ended, creative toys to spur imagination. There are wooden letter and number blocks, jumbo wooden stacking blocks, a baby doll with various accessories, toy food, balls and more. 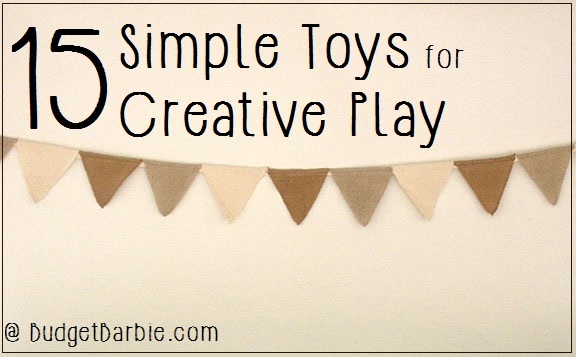 It was glancing at my Family Room corner this morning that gave me the idea for this post on Budget Barbie - a new series I am calling "SIMPLE TOYS FOR CREATIVE PLAY". I hope to find the time to do at least three of these in the next month or so. The idea is to find toys that are open-ended play inspired. Creativity driven. Toys that don't just do one thing over and over but can be used and played with (and loved) for years instead of merely hours or days before boredom sets in or they break. I found links for each and every item idea on Amazon - but I decided not to post prices as they change often and I wouldn't want to quote a 'wrong' price. I did not that most all of these offered free shipping through Amazon - either with a minimum purchase or with Amazon Prime which a lot of people already have. A couple of these toys I actually played with when I was child... and one of them (like Lincoln Logs) your parents' parents may have played with as they have been around for a hundred years. A LINCOLN LOGS CLASSIC, JUST THE WAY YOU REMEMBER IT - Inspired by one of the original LINCOLN LOGS builds, the "Meeting House," this 100th Anniversary Tin will evoke nostalgia in older generations and bring happiness to children. The manual offers three building ideas: a tall tower, two small houses with a bonfire, and a large cabin. Children can follow these guides or mix and match to build their own structures. 111 ALL-WOOD PIECES - The package includes 111 pieces made of real, high-quality maple wood. Each has indentations that can be used to connect it with others. Pieces are included for the roof, roof facade, walls, chimney, porch, fences, bonfire, and bonfire seats. COLORFUL DESIGN - These exquisitely crafted LINCOLN LOGS are beautifully stained, like a true cabin's finish. Each piece is colored with precision and careful attention to detail to evoke the nostalgia of childhood. Most of the log blocks are stained bright brown. The face of the roof is a muted red, and the rooftops are forest-green. EASY AND QUICK CLEAN-UP - All the pieces can be stored in the set's collectible tin. The features make clean-up easier, as parents can store it in one container, keeping living spaces and children's playing areas tidy and organized. The covered tin can be stored after play time for safe keeping. AMERICA'S NATIONAL TOY- Invented in 1916 by John Lloyd Wright, the son of architect Frank Lloyd Wright, LINCOLN LOGS have become America's National Toy. Beloved by four generations of builders, they provide hours of fun while building a solid foundation in STEAM/STEM subjects. DEVELOPMENT BENEFITS - LINCOLN LOGS supports key areas of a child's development. As children stack the parts and discover how the building system works, they strengthen their hand-eye coordination, fine motor skills, problem-solving skills, and spatial awareness, and they exercise their imaginations! COMMITMENT TO QUALITY - The wooden pieces are responsibly made in America, with 70% of the wood coming from Forest Stewardship Council (FSC) certified forests or other forestry-managed timberlands. We test to the strictest quality and safety standards, ensuring that your child has a successful, trouble-free building experience. Zaleny is the sole authentic seller of the product on this page. Genuine item only offered by Zaleny and Fulfilled by Amazon. Includes: toolbox, big hammer, wrench, spanner, pliers, nippers, screwdriver, ruler, drill, pipe wrench, small hammer, saw, chisel. The Tea Set consists of a teapot, sugar bowl, milk pitcher, 2 tea cups, 2 saucers, 2 tea spoons, 2 tea bags, and 2 cubes of sugar. Portable wooden barn opens wide for easy play access and closes up to take with you. Features a handle for easy transport. Includes seven realistic plastic farm animals, a wooden ladder and a folding corral. Fun Occupational Therapy Skill Toys that Teach! SATISFACTION GUARANTEED; we offer superb educational toys and excellent customer service and if you're not totally satisfied with your purchase; we also offer a risk-free, No-Questions-Asked, 100% Money-back Guarantee! Click the orange button to order now! This baby shape & color recognition toy set of children's beads is designed for baby's first lacing. The jumbo size is perfect for baby and toddler little hand to handle with ease. This educational beading activity toy for kids helps to develop fine motor skills, dexterity and hand-eye coordination. It can be used for learning color sorting, arts and crafts. An ideal gift for 2 year old boy or girl. The child development lacing beads for toddlers kit includes Large / Jumbo 1.5 inch plastic multi-colored beads with 4 strings in various shapes and colors to allow children to easily string, sort and lace through the large hole. The hard plastic makes it ideal for sanitizing and keeping daycare and shared toys sanitary. Includes saucepan, stockpot, frying pan, 2 lids, oven mitt, wooden spoon and wooden spatula. The perfect accessory for Melissa & Doug play food and wooden kitchen sets. Encourages imagination, dexterity and creative play.